The brand new, bespoke building opened its doors at the start of the new term providing state-of-the-art facilities for study in a range of construction trades including brickwork, wall and floor tiling, plumbing, plastering, carpentry and joinery, painting and decorating and sustainable construction. With the introduction of new facilities for students to use such as dry lining and suspended ceilings, Barnsley College is at the forefront of providing outstanding qualifications to allow students to get a head start. The centre houses innovative and inspiring work areas with industry led equipment providing a high quality learning experience for students. Facilities include new workshops, classrooms and machinery incorporating a comprehensive IT network supported by industry standard software; a project workshop for new construction technologies; break out areas allowing students to work independently and dedicated student support encouraging positive progression into employment or further study. Full-time students studying Construction at the centre now also have the opportunity to undertake work experience within the industry providing them with further skills for their future. A Construction Industry Training Board report predicts that 182,000 new jobs will be created in the construction industry by 2018 which means there are more opportunities than ever for securing a rewarding and profitable career and Barnsley College is preparing it’s students for just that. Barnsley Academy pupils have recently been building on their very own construction skills in a series of practical taster courses. The pupils were shown demonstrations of plastering, wall and floor tiling and painting and decorating before trying it out for themselves. 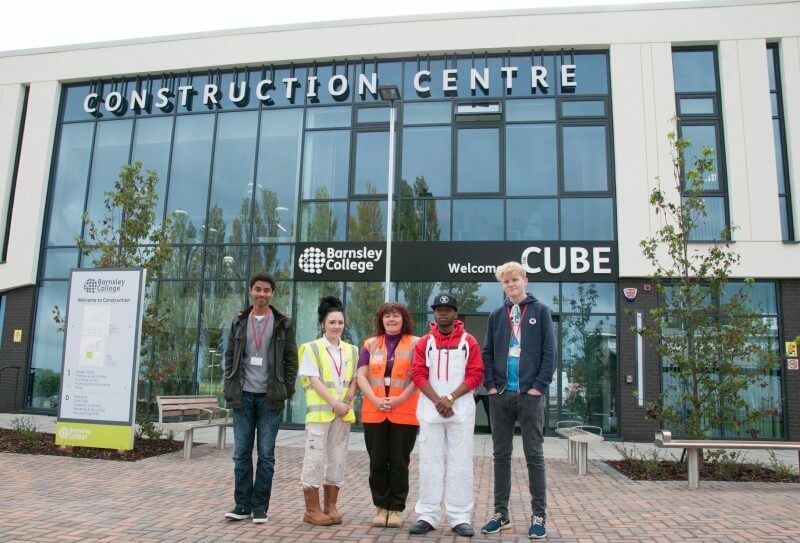 For more information about Construction courses at Barnsley College contact Tel: +44 (0)1226 216 123. For students wishing to get higher level construction qualifications, University Campus Barnsley offers full and part-time Higher Education courses in Construction to ensure students can complete their pathway to their dream career. To find out more about courses at UCB visit universitycampus.barnsley.ac.uk.